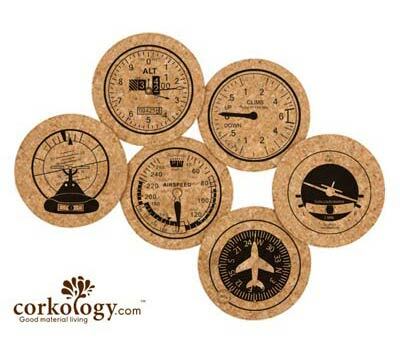 The Aviation Cork Coaster set from Corkology is a set of 6 instrument themed coasters. The made in the USA coaster set includes an image of an altimeter, airspeed indicator, altitude indicator, turn coordinator, heading indicator and vertical speed. Each coaster measures 3.75" in diameter and have aviation facts and quotes on the back.